I ate prime rib twice in a weekend. Had more onion rings and baked beans than a Fourth of July picnic. Finally figured out that I do like sweet tea. Destroyed some baked mac and cheese. Tried the grits; will have to give them another chance someday. Didn’t get to experience nearly enough barbecue for my taste. And discovered a new dish that I’m adopting into my own arsenal: Corn Pudding. I didn’t even know what Corn Pudding was until it was plopped on my plate. 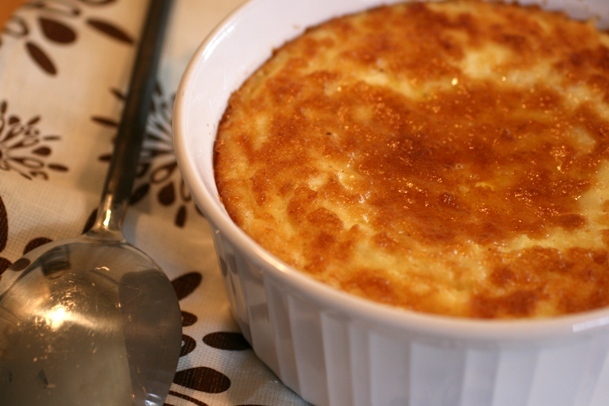 It has the consistency of a custard–eggy, soft and fluffy, but with a little crunch from the kernels of sweet corn and hint of corn meal mixed in. It’s sweet and salty, soothing and crunchy, side dish and dessert. Total Southern Comfort on a plate. Needless to say, I had seconds. I came home in search of a recipe that would do my Tennessee Corn Pudding experience justice, and I think I figured out one that works. I made a few small tweaks to a couple of recipes I found online to get the consistency I liked. I also added bacon, because–well, everything is better with bacon. Everything. If you’re in need of a warm, comforting dish to serve along with barbecue, steaks, salmon, or a big salad, give this one a shot. You won’t be disappointed. Preheat your oven to 400°. Grease a round, flat-bottomed 2 quart casserole dish. In a large bowl, lightly beat the eggs. Add the melted butter, sugar, salt, and milk. Whisk in the cornstarch and cornbread mix. Stir in the corn and creamed corn. Blend well with hand mixer. Stir in the bacon. Pour the mixture into your prepared casserole dish. The pudding will have a little “jiggle” to it when you take it out of the oven. Run a dry knife into the center of the dish, and if it comes out clean, the pudding is ready. If it comes out too wet-looking, give it another 5 minutes or so in the oven.